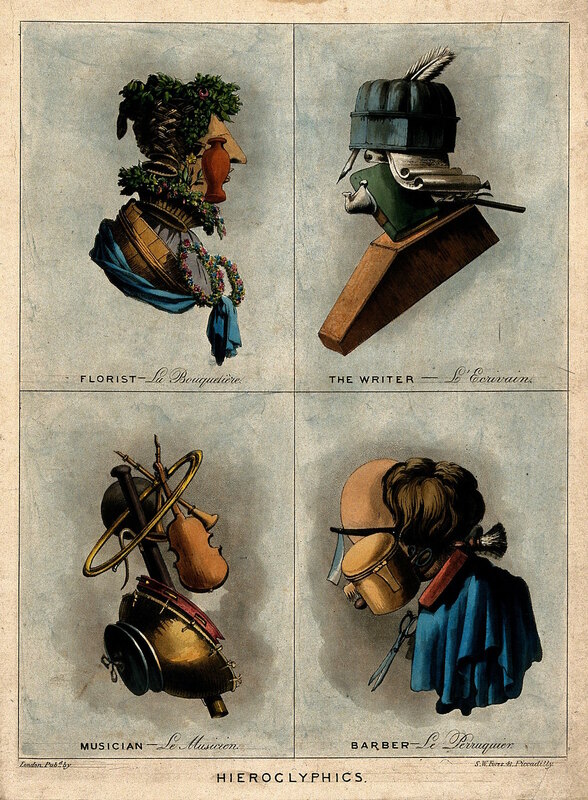 Lovely aquatint print from the London-based publisher Samuel William Fores in which are depicted four composite portraits for the professions of florist, writer, musician, and barber — their features made up entirely from the tools of their trades. Such composite portraits, in which human figures are comprised completely of objects, were pioneered several centuries earlier by the 16th-century Italian painter Giuseppe Arcimboldo. 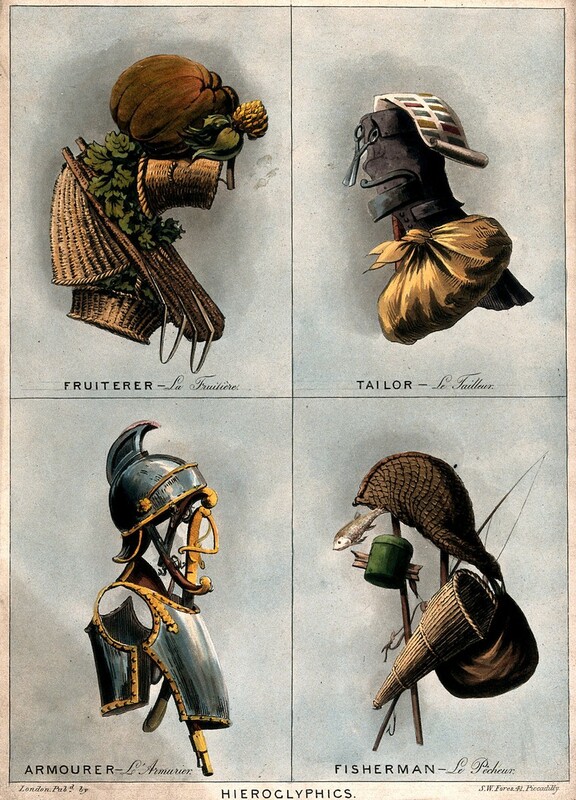 Although the metamorphosis didn’t extend as far as the human body itself, a mention should also go to the following century’s Nicolas de Larmessin and his series depicting tradesmen clad in outfits comprised of their related objects. The title of “Hieroglyphics” is also worth a note. If, indeed, the print dates from around 1800, then it would place the image soon after the discovery in 1799 of the Rosetta Stone by Napoleon’s troops during their invasion of Egyptian — and so at a time when the idea of hieroglyphs would have been very much in the air. Still, the title seems strange in relation to our current understanding of the word as denoting a system of writing in which pictures are used instead of words. In the case of the above image, it as though the act of replacement itself is enough, be it a word or a swathe of face, it does not matter — the whole world seen as renderable in a landscape of objects. 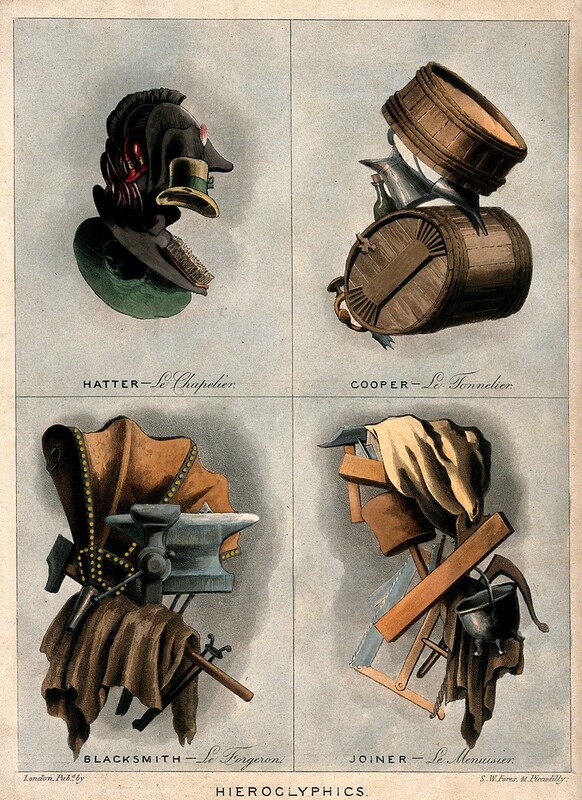 *UPDATE: We found two more from the series, also in the Wellcome collection.